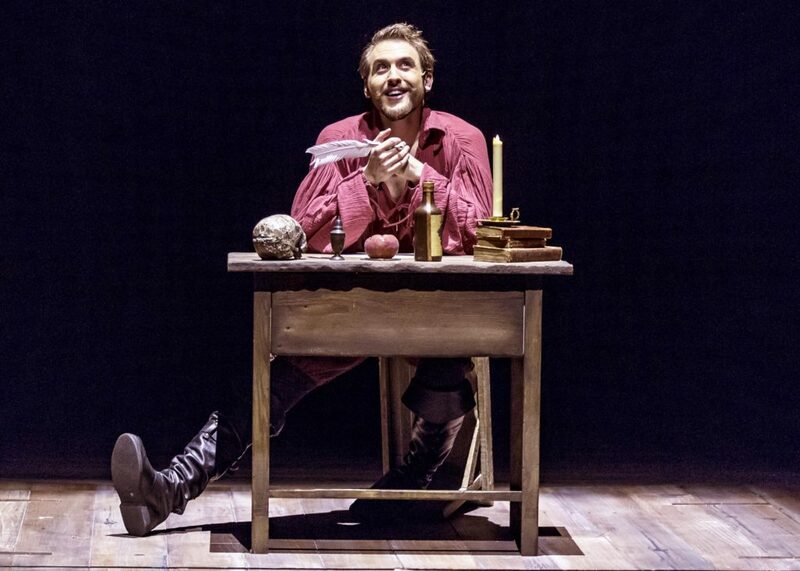 EXTENDED Thru June 18th “Shakespeare in Love” (Chicago Shakespeare Theatre): Enchanting! 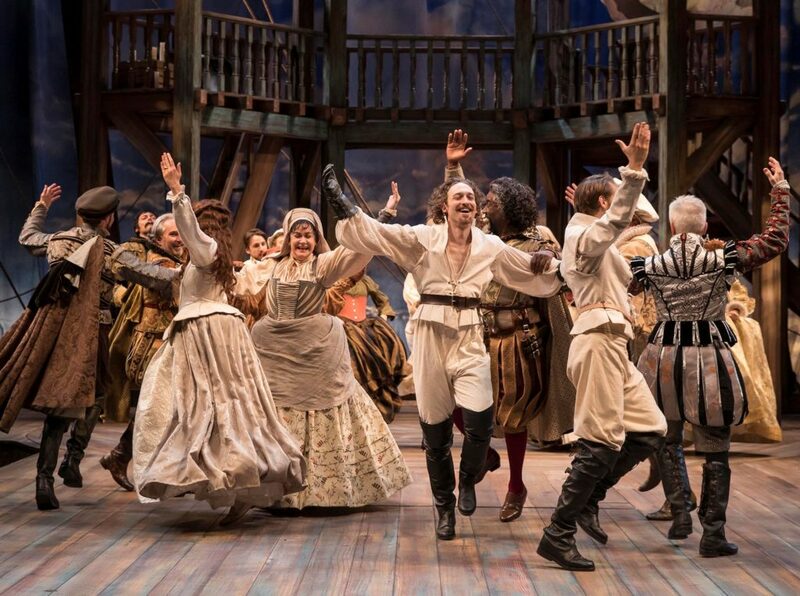 Chicago Shakespeare Theater presents SHAKESPEARE IN LOVE. I loved the movie. I loved this play. Screenwriters Marc Norman and Tom Stoppard imagined Will Shakespeare’s writing process in creating his masterpiece “Romeo and Juliet.” The romantic comedy has the penniless playwright (played by the charismatic Nick Rehberger) struggling to tell a story. When he falls for the betrothed Viola (played by the effervescent Kate McGonigle), his quill is freed. He begins to write with a fervor in this enchanting play within a play. To layer on the love obstacles, McGonigle is also disguised as a man to perform on stage. 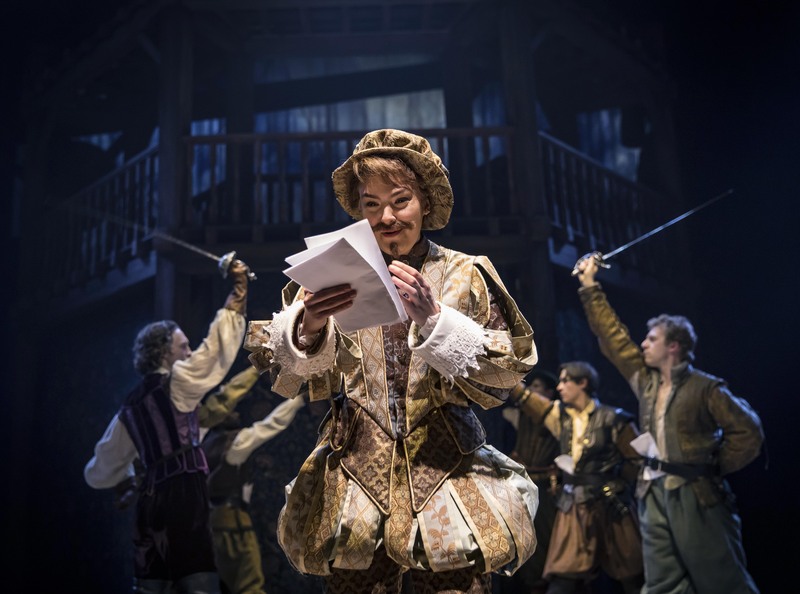 Mistaken identities and witty dialogue add to the comedy in this Elizabethan theatre treat. Art imitates life. And life imitates art. Adapter Lee Hall brings the film to the stage. In Hall’s version, Shakespeare’s rival Kit Marlowe (played by Michael Perez) has a bigger role. Kit and Viola both serve as muses to unlock Will’s genius. One particular hilarious scene has Rehberger and Perez doing a Cyrano-style shtick underneath McGonigle’s balcony. Perez feeds Rehberger the words to woo his ‘Juliet’. The successful assisted flirtation ignites the Rehberger and McGonigle sizzle. Wow! I am in love with SHAKESPEARE IN LOVE. The smart script has plenty of personality and jokes. Rockwell brings to life all these characters in a swirling madcap romance. And it even has a dog (played by Dash). So much to love! This is your spring fling! Get a ticket!